A two-dimensional exploration action adventure game with RPG and survival elements, developed by the debuting Ellada Games. The action is set in a fantasy world inspired by Viking mythology. Niffelheim is an indie action RPG game for PC developed by the debuting Ellada Games. We assume the role of a nameless Viking who has died and wants to go to a paradise but to do so, he has to go through a Nordic purgatory first. The place is not only filled with picturesque locations but also numerous dangers that the protagonist has to face by expanding his fortress and protecting it from enemy attacks. The game is two-dimensional and limits the hero’s range of motion to four directions: left, right, up, and down. The most important element of Niffelheim is combat with the use of melee weapons (sword, clubs), shield, and a bow. The fighting system is simply based on attacking enemies and protecting the protagonist from their attacks. Both the hero’s and foes’ health is indicated by classical health bars. The Vikings protagonist can restore some of it by eating and drinking potions. The classical crafting system is equally important. New items—including the enhancement for the fortress (the protagonist’s base of operations)—can be made after collecting required raw materials. We can craft new equipment, outbuildings (which provide food or crafting materials), and other enhancements. The character development system is based on gathering experience by fighting, looting caves, and trading with craftsmen, among other things. In the future, the possibilities are to be extended by introducing an arena mode where Vikings can stand inside lists and fight spectacular battles. Niffelheim does not punish the player with death. With each decease, the Viking (who is dead, anyway) respawns at his fortress. The only way to permanently kill the protagonist is to destroy his base, which is regularly attempted by invading enemies. 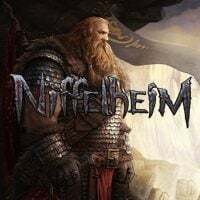 Niffelheim offers access to a multiplayer mode where players, who assume the role of a Viking who rules one of four available lands, can either fight one another or cooperate to defeat increasingly powerful enemies. Niffelheim for PC features two-dimensional hand-drawn and very detailed graphics. The visuals created by artists at Ellada Games are characterized by unique and cold atmosphere that is typical of Nordic tales. The setting is consistent and clearly follows the “icy” leading theme. We can not only visit snowy areas overgrown with coniferous trees but also dimly lit interiors of caves that are full of dangers. We tested Niffelheim from Ellada Games, the self-proclaimed 2D open world fantasy RPG. Does the lonely journey of a Viking warrior through a frozen realm have any chance to be remembered?